A unique Chinese Landmark in Chiang Mai! The beautiful Chinese Temple next to Win Place Hotel is one of the unique Temples I saw. 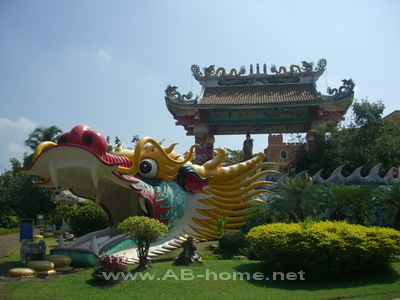 On the Mahidol Road in Chiang Mai is this holy Dragon Temple located. Belivers come to worship the huge Dragon and the Buddha statures for good luck in all day life here at Kuan Yin Bodhisattavas in north Thailand. The tourists come to make some pictures from the big Dragon which is the entry to the shrine. The Chinese Temple “Kuan Yin Bodhisattavas” is as well famous as Kuanin Bodhisattavas and is a nice destination for friends of Buddhist temples and culture tourists in Chiang Mai. If you want to watch this Chinese landmark in Thailand than follow the Mahidol Road to Win Place. The vegetarian festival in October is the best time to travel to this Chinese Wat, but a visit is worthwhile all year at this Dragon Temple in northern Thailand. 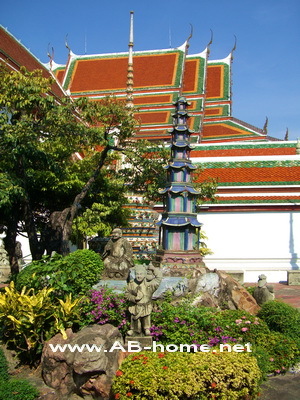 Wat Arun Rachawararam is also known as “The Temple of Dawn” or just Wat Arun. This beautiful temple on the bank of the Choa Praya is built in Thailand’s Ayutthaya period as “Wat Makok”. King Taksin renamed this Buddhist temple in Bangkok to “Wat Jeng” when Thonburi become the capital of Thailand. King Rama II let renovate Wat Arun and give it the name “Wat Ratchataram”. 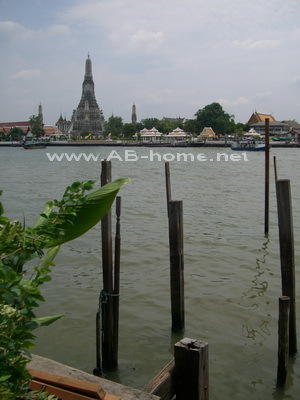 Under King Rama IV it becomes the present name “Wat Arun Rachawaram”. Many believers come here to this holy place in Bangkok to worship Buddha. 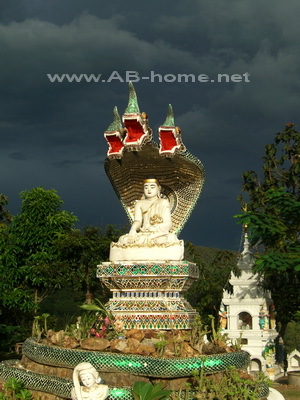 The foreigners come to see the adorned holy stupa and the stone statures. Especially at sunset is the Wat Arun a magnificent model for beautiful holiday pictures. After a visit at this temple on the west bank I will recommend a visit at Wat Pho which is just on the other side of the Chao Praya River in Bangkok and good to reach by ferry. The full name is actually Wat Phra Sri Rattana Sasdaram but this temple in Bangkok is better known as Wat Phra Kaew temple. This imposing temple in Thailand’s Capital is on the same compound as the Royal Grand Palace. King Rama the first gave the mandate to build this holy Buddhist monument. Many tourists come here to see the Emerald Buddha, Golden Buddha statues, Golden stupas, the impressive statures of all eight Kings of the Chakri dynasty and many other beautiful and impressive monuments and holy places. Worshippers come to pay their respect of “Phra Kaew Morakot” (The Emerald Buddha) and to the most hallowed compound in Thailand where the ashes of many former Monarchs are enshrined. The Wat Phra Kaew in Bangkok is a great destination for all who like to see a grandiose temple and learn something about Thai culture. The River Express is the cheapest possibility to reach the Phra Kaew Temple. Taxis and Tuk Tuks are a bit more expansive and mostly slower because of the traffic in central Bangkok. 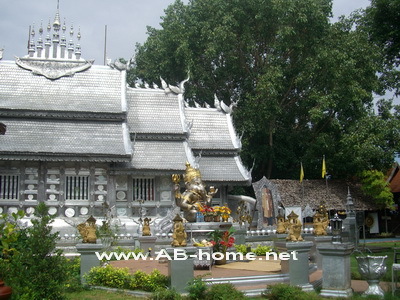 In 1502 the first pure silver ordination hall in world was build here at Wat Srisuphan in Chiang Mai. 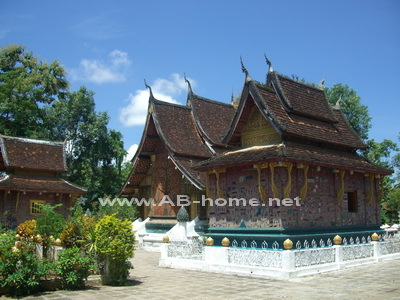 The Buddhist Temple in Laana style is a bit in south of the moat near Pratu Chiang Mai. Here you can come for a conversation with the Monks in English language. The “Chat with the Monks” is every Tuesday, Thursday and Saturday from 5:30 – 07:00 pm at the silver temple Wat Srisuphan. This is a good chance to ask the Buddhist Monks about Thai culture, life as a monk in north Thailand, meditation or other thinks where you are interested in. 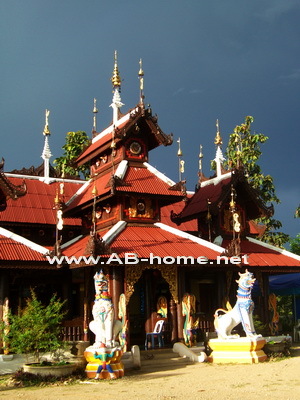 This Sisuphan temple is as well famous for the public meditations three times per week. Everybody is welcome to join. The great silver ordination hall has a dimension of 5 meters wide and 18 meters long. 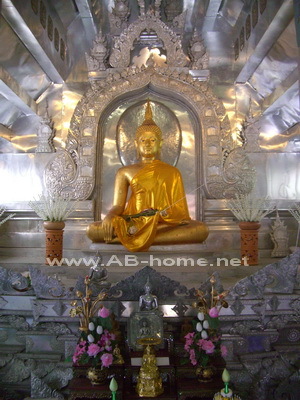 The Buddha image inside the temple look very beautiful, the contrast of the silver to the gold let him appear and silhouetted against other temples in Chiang Mai or somewhere in Thailand. The Wat Pho is the most magnificent Buddhist Temple of Bangkok in Thailand. Many believers, tourists and backpacker come every day to see the beautiful temple architecture, Buddha images and of course the biggest reclining Buddha of Thailand. The reclining Buddha at Wat Phra Chetuphon (Wat Pho) is 16 meter high and 46 meter long. Phra Chetuphon temple has as well the biggest collection of Buddha images. The ample area of this beautiful and impressive temple housed many beautiful corners and gives a great guideline for good pictures of your visit in Thailand. The nice Buddhist and historical mural paintings was my highlight of this temple. Wat Po is as well famous for the Thai Massage school/university which teaches the technician of the traditional Thai Massage. The Tripitaka Library which contains holy Buddhist writings is also located at the most visited temple in Bangkok. Wat Pho in Bangkok is direct in the center of Thailand’s capital. You can easy arrive by Tuk Tuk, Taxi or River Express which is the cheapest possibility. If you stay in Bangkok don’t miss a visit at the famous Wat Pho. 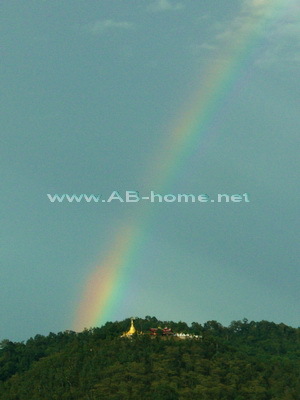 Wat Pla That Doi Mounjing is a non touristic temple in northern Thailand in the Chiang Mai province. The small Pla That Temple is on the top of a hill near Chiang Dao. From here there is a great view over the environment of this area and the landscapes of Chiang Dao. The best way to arrive to the Wat Pla Doi Mornjing Forrest temple is by car from Chiang Mai or by motorbike from Chiang Dao in Thailand. Follow the street from Chiang Dao to Fang and look for a golden Buddhist stupa on a hill about on the half way to the Pha Dang national Park. It’s a small but very beautiful temple and a good destination for all who like to meditate, relax or to watch a nice panorama in South East Asia with mountains and rice fields. The Wat Pla That was one of our travel highlights on our trip to the area around Chiangdao in north Thailand and I can recommend to visit the temple if you looking for cultural and non touristic places. The Phra Doi Suthep Temple on the high mountain near Chiang Mai is one of the holiest one in northern Thailand. 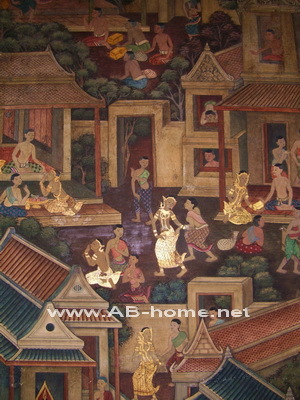 1383 the Wat Doi Suthep is build during the reign of King Keu Naone. 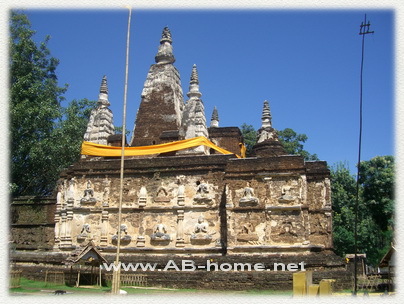 The present temple complex is from the 16th century and was restoring many times later. On the food of the 306 steps to the holy Buddhist temple on the Doi Suthep Mountain is a parking place and many shops who sell drinks, souvenirs and food. If don’t can handle the steps to the Wat Phra Suthep than you can use the free cable car to the top. The Forrest temple is a really beauties one, many tourists and of course believer from many parts of Thailand come here to visit the holy Buddha images and to enjoy the great view over Chiang Mai City. This day trip to Doi Suthep is one of my favorites and I really can recommend this trip for all tourists and backpackers who are interested in Thai culture and Buddhist Temples here in northern Thailand.